Battlefield archaeology: The fieldwork, led by Dr Glenn Foard, is now underway. Although exciting, it is still early days with regard to any initial findings. The number of volunteers involved at this stage is low but will gradually increase as the work progresses. A local barn has been made available for the processing of finds and the painstaking work of identifying and conserving anything of historical interest, from any era, will be monitored through the Portable Antiquity Scheme. Landscape archaeology: Dr. Tracy Partida used the landscape of the near-by Croft Estate and Iron Age Hill Fort to demonstrate how the landscape can be read from topographical features, evidence of ancient routes, land usage over time and early maps (including estate maps) to determine how the battle might have proceeded. The view from Yatton Common shown here has features which have existed for hundreds of years, with the main route from Wigmore castle, Edward’s Yorkist base, to Mortimer’s Cross running through the valley. This talk and walk will be repeated next year for those volunteers who could not secure a place the first time. Archived documents: A group of volunteers received training in the Hereford Records Office to support future work in locating and examining archived material which may shed light on the battle from a more local perspective, given the dearth of primary source material. This was oversubscribed and another archive session is to be organized in the New Year. Telling the Story: At the Ludlow Medieval Fayre on 24/25 November Martin Hackett displayed his highly detailed model of the battle; this display enthused many people, from both home and abroad, who were interested to hear both the story of the battle and the project work that lies ahead. Various local organisations have also enjoyed talks on the project. This all helps raise awareness of the significance of the battle. In October the medieval supper at the Corners was simply delicious; with fascinating music played by Alan Hewitt and a remarkably interesting quiz: this raised some additional funds for the project. This is the same contact details if you wish to receive future project updates. Project progress This summer an aerial survey from Shobdon Airfield, courtesy of Swiftlightflight, provided an opportunity to look at the features in the landscape exposed by the dry weather, although nothing of significance relating to the battle was observed this time. Landscape archaeology to uncover ancient clues as to how and where the battle may have been fought and document research into the battle is underway. Battlefield investigations led by Dr Glenn Foard with their inherent uncertainties and potential begin this autumn. Volunteers There are now a substantial number of volunteers who bring a host of skills to the project. Opportunities for volunteers to become involved will evolve gradually as the project develops. The talk and walk of the landscape for volunteers by Dr Tracey Partida, Landscape Archaeology Director, is now fully booked although further landscape walks will be organized. Opportunities for volunteers to learn how to research documents are also in the pipeline. If you wish to be involved as a volunteer please fill in the online registration form via this LINK. Or contact the Project Director Gary Ball mx1461cbap@gmail.com Recording your particular area of interest in the project will allow us to direct you to the relevant volunteer opportunities. Project promotion The project was promoted at the Angelfest in Kingsland this August with opportunities to meet some of the team. Gary and Jan Ball displayed their fascinating battle related weapons and medieval artefacts and over 100 people visited the model of the battle in Kingsland Church. Built and hand painted by Martin Hackett the well-known battlefield author and wargaming expert it contains thousands of accurate figures of the various factions who fought with the two armies and a plan of how the battle may have been fought. This model will be shown at the Medieval Fayre in Ludlow on 23-25th of November. April 27th 2019 Annual battlefield walk with other events to be announced. The project is about to begin investigations. Document research, landscape archaeology and the collating of local knowledge will be undertaken before the battlefield investigation. Due to the significance of the battle and in spite of so little being known about it, the project to discover more about the Battle of Mortimer’s Cross has already captured people’s imaginations, and interest in this project comes from far and wide. What is clear is that very little is known about the actual details of the battle from those accounts written relatively close to the time. Therefore there is a lot to discover. It became known as ‘The Battle of Mortimer’s Cross’ but even the location of that ‘cross’ in 1461 has not yet been found. We know the names of some of those people who fought in the battle and that the Lancastrian Owen Tudor, husband of Henry VI’s mother, was beheaded in Hereford soon after. We can make an educated guess but we have no definitive information about the numbers of those who fought or died here. Battlefield historians use the topography, local stories and knowledge of how battles were fought at this time to theorise about how the battle began and proceeded. We know that King Edward IV founded two chantry chapels in Kingsland church to pray for those who died. We also know that following this battle Edward rode to London and was proclaimed king, before being crowned after his victory at the Battle of Towton. There is a lot to do and whatever is uncovered our knowledge of that fateful day on February the 2nd or 3rd 1461 will undoubtedly increase. Information from the wider community about the battle: reported or actual finds; place names; folklore and stories as to where the bodies might be buried. Much of this information may have become badly distorted over the centuries but perhaps one or two snippets may be very valuable and they will all be followed up. Please contact Project Secretary Patricia Pothecary 01568 708597 patricia@pothecary.net if you have information or ideas you would like to share. or if you would like to be added to the supporters list. Volunteers will be needed for specific tasks such as local document research or chasing local information and also some for fieldwork. If you have already offered your help then Gary Ball the Project Director mx1461cbap@gmail.com will be getting in touch. If you wish to volunteer in any capacity, and have not already done so, the online registration form can be accessed via this LINK. Recording your particular area of interest in the project will allow us to direct you to the relevant volunteer opportunities. Just click here for the latest Mortimer Matters magazine which includes society news, 2018 events plus lots of local history articles and information. 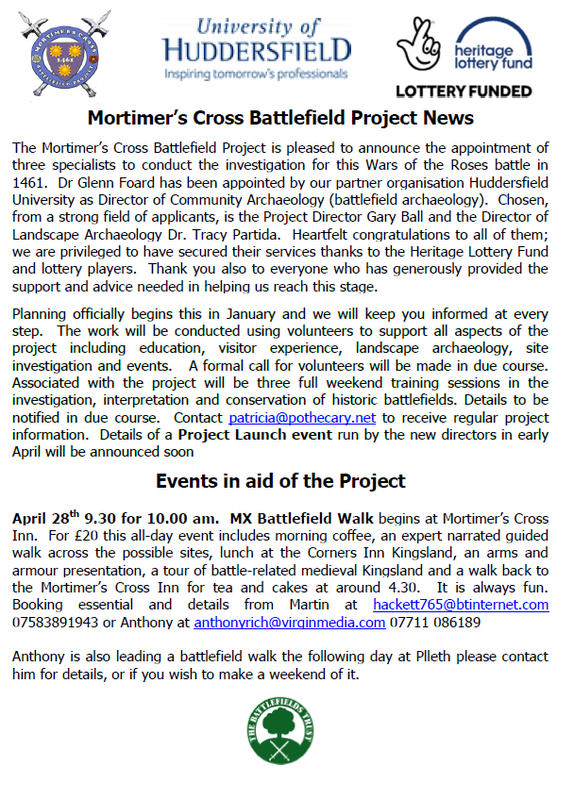 We are thrilled to announce that a Heritage Lottery Fund (HLF) grant of £84,400 has now been awarded to the Mortimer’s Cross Battlefield Project,a local group of the Battlefields Trust. Made possible with money raised by National Lottery players, we can now begin to investigate the site of this ‘Wars of the Roses’ battle and raise awareness of its historic importance in leading Edward IV, the first Yorkist King, to the throne. Very little is known or written about this battle, but battlefield specialists, alongside local volunteers and students hope to piece together a more accurate picture of this significant event. Work will begin in the new year and finish in 2021 when visitor information will be completed. We will be sending out specific details of the various tasks that volunteers will be asked to help us with, once the project is underway. This autumn our task is to appoint Project and Archaeology Directors. As many of you know, Yorkists battled Lancastrians and the victor was Edward, Earl of March, a Mortimer descendent. Once crowned he took as his badge ‘The Sun in Splendour’, due to his triumph at Mortimer’s Cross, still used in the Queen’s regalia today. Landscape and battlefield archaeology, in partnership with Huddersfield University, will provide unique national training in the methodology required in uncovering the secrets of the site. Project archaeologists and volunteers will also seek to find where those who died are buried before evidence deteriorates further. The project will set historic interpretation panels at key points in the landscape and provide a permanent visitor information display at the Mortimer’s Cross Inn for the many visitors to the site. Battlefield walks, regular events and activities for schools will tell the story to young and old alike. Find details of the story at www.battlefieldstrust.com or in Geoffrey Hodges’s book ‘Ludford Bridge and Mortimer’s Cross’ which is sold at project events. This organisation covers all the local History societies and they issue a very useful newsletter with all sorts of information from local history groups including meetings, walks, open days and events generally. So do have a read if you have an interest. You can access the September – November 2017 newsletter by clicking the link here. We have now heard from the Heritage Lottery Fund (HLF) and, not unexpectedly, are being asked to resubmit our bid. One thing we must do is raise some money ourselves which we estimate to be between £5,000 and £10,000 to strengthen our bid. We already have £1,000 pledged and are looking into some local trusts. As we still need to keep the project relatively low key until the archaeology is completed, we are asking for pledges from our supporters first. This money will go towards four specialised, outdoor history interpretation panels to be located at key points including Kingsland Church and the MX Inn and, if the larger sum is pledged, the visitor information displays at the MX Inn. If you feel able to pledge a donation, no matter how modest, towards these panels please contact Ian Maddox at ian.maddox@outlook.com Your pledge will be anonymous known only to Ian and the Battlefields Trust (BT) Treasurer. Once the project is underway, with or without HLF funding, we will ask for the pledges to be released into the BT account where 100% will be ring fenced for the panels. We have good support from a host of organisations and experts, including the National Trust and English Heritage, as well as the MX Inn which is to host the main visitor information display, not forgetting the Battlefields Trust under whose umbrella this locally run project operates. Mortimer’s Cross Battlefield Walk May 6th. A major aim of the project is to raise awareness of the battle for all age groups, for example by improving visitor experience and perhaps locating the site more accurately. One exciting development will be the landscape archaeology to map the area as closely as possible to how it was in 1461 and to teach people how to read their historic landscape. A comprehensive description of the battle can be found on the Battlefield Trust’s website. We should know if our bid for Heritage Lottery Funding is successful before the end of 2016.The intention to locate the site more accurately and provide visitors to the site with information about the battle will then move ahead. One firm date for your diary is May 6th when the annual Mortimer’s Cross battlefield walk will take place. Led by experienced battlefield walk leaders, this will be an all-day event and will include morning coffee, lunch and afternoon tea and cake. There will be a minimum of two walk routes. At least one of these will differ from previous years for those who wish to walk again but experience a different perspective. Another will be our traditional walk of the two most likely battle sites, plus post lunch events in Kingsland and an afternoon return walk. Details and booking forms for this walk will be posted in due course in 2017. The walk has been oversubscribed each year. More events to come will be connected with medieval village life and the battle so watch this space. 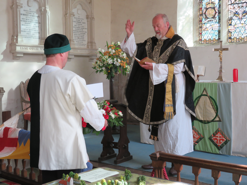 We commemorated 555 years since the battle with a ceremony at Croft Castle Chapel in September. Our first AGM was held in October and we still need an Honorary Treasurer for managing small funds. Larger funds will be managed by the Battlefields Trust who are our umbrella organisation. If you feel you can spare time for four meetings in the year and can help please contact us. We now have support from a wide range of organisations and individuals, including Historic England (previously English Heritage) and the National Trust. Plans for battlefield, landscape and community archaeology as well as events, visitor experience, education and publicity are in place. A supporters list stands at over 140 people. The project is moving forward and we are currently preparing the final stages of a bid for Heritage Lottery Funding to enable us to develop a heritage package to include all age groups. The intention is to raise awareness of the significance of the battle and it’s impact on the broader history of England and the monarchy. It is also intended to produce various information points, including at the Mortimer’s Cross Inn and eventually some interpretation panels for visitors to the site. In the meantime we would like your help. To secure funding, we need to show that there is an interest and will be sending out a form in a week or so in order to demonstrate that the project intentions are supported by the local and wider community. If you wish to be involved at any level and haven’t already described what you would like to be involved in, or are not on the supporters list please contact our Secretary patricia@pothecary.net 01568708597 and you will receive the form to record your area of interest in due course. 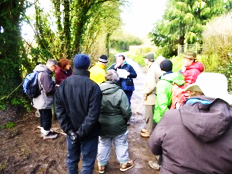 The walk on April 16th was very successful, there were over 50 people who enjoyed a full day of guided walks, an arms and weapons demonstration and a tour of battle related sites of medieval Kingsland. A big thank you to all the volunteers and especially to our expert organisers and walk leaders Anthony Rich, Martin Hackett and Ian Maddox. There will be a variety of more walks planned for the future. On the weekend of September 10th and 11th 2016 Jason OKeefe will be running two full days of MX battle re-enactment events with a host of activities for the whole family to enjoy at Croft Castle. We will hold the MX Battlefield Project AGM at this event and a commemoration of 555 years since the battle. Exact location, day and timing of our AGM and commemoration will be published in due course. Famous for the sighting of Three Suns in the sky (a “parhelion”) this local Wars of the Roses battle in February 1461 changed history for ever. Every British monarch since Henry VIII is directly related to both the rival leaders: Edward Earl of March, (the victor who became King Edward IV), and Owen Tudor, (who was defeated, captured & executed, but founded the Royal House of Tudor). Why, how and where did this major historical event take place? Join published historian Martin Hackett, accredited Battlefield Guide Anthony Rich, and Chair of the Battlefields Trust’s Mortimer’s Cross Project Ian Maddox on Saturday 16 April 2016 to help search for the answers. 10:00 to 1020 Introduction: sets the scene for the day, and gives you the historical context of the battle. All participants can attend both a walk round battle related Medieval Kingsland and also a Presentation in the Village Hall on Armour, Weapons and Equipment. Groups will alternate between the two activities. 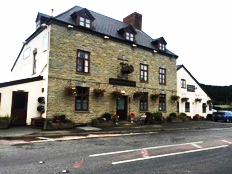 16.20 to 17.30: Walk via the Battle Monument to Mortimer’s Cross Inn. We walk back across the Northern Battlefield Site to our start point for tea and cakes, a presentation on the aftermath of the battle, and an open discussion of topics raised during the day. A suggested donation of £20.00 per adult (£15.00 for Battlefield Trust Members) is invited to cover everything provided on the day (including lunch but excluding lunchtime drinks) & fund further research. Walks suitable for anyone able to undertake a 3 mile cross-country walk at a gentle pace using paths, tracks & minor roads. Mud & stiles may be encountered en-route. Organisers reserve right to amend or cancel all or part of the programme without prior notice. Places are limited so pre-booking is essential & for updates/changes. Equally important is to raise the profile of the battle in the local and wider community, to support schools in their work on local history, to provide information and events for local people and tourists alike and, in the process, help protect sensitive sites and increase revenue for local business. The project is being overseen locally by Ian Maddox from Shobdon and Patricia Pothecary from Kingsland. They are supported by a group of local people with skills in administration, design and fundraising. We are also supported by battlefield experts from further afield, including Anthony Rich from the Battlefields Trust and and Dr Glenn Faord reader in Battlefield Archeology at Huddersfield University. The battle of Mortimer’s Cross was fought on February 2nd 1461 close to the village of Kingsland. The site also straddles the parish boundaries of Shobdon, Aymestrey and Lucton. Some reports indicate that up to 4000 soldiers lost their lives that day as the Yorkists defeated the Lancastrians. 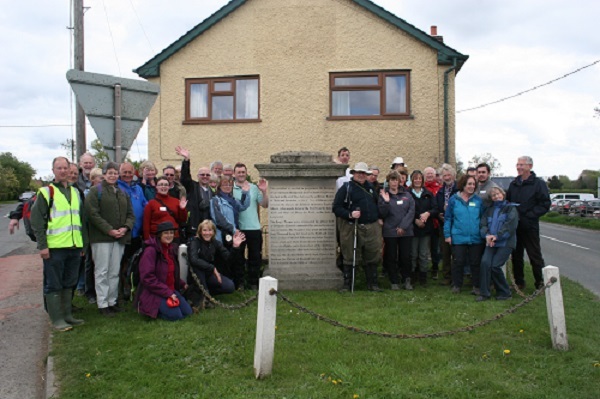 The project was launched with an all day walking event on Saturday 25th April which looked at the possible Southern and Northern battlefield sites and viewed possible ambush points in the hills around. An arms and armour presentation and tour of the battle related sites of medieval Kingsland completed the programme. With over 50 people in attendance, local interest, as well as interest from further afield, is high. 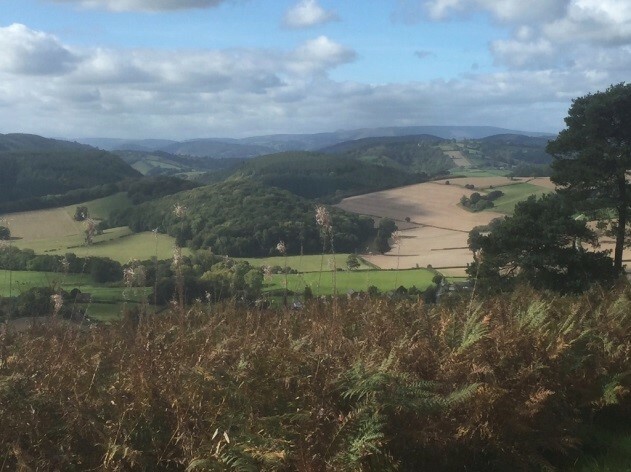 The Battlefields Trust is planning another walk and is also helping to set up a Mortimer’s Cross Battlefield Society to further raise awareness and support the project. Those who are interested in joining such an exciting project can e-mail patricia@pothecary.net or ring 01568708597 for details. The Battle of Mortimer’s Cross – Can you help? English Heritage is considering whether to designate the site of the Battle of Mortimer’s Cross as an official Battlefield site. They are working with the Battlefield’s Trust who would like to find answers to the following questions. Which local groups are interested in the battle? Who are the experts on the battle? Which documentary or other sources, other than some general ones EH has identified to the Trust, should EH consider? Local stories or knowledge will also be particularly useful for cross referencing with other sources, no matter how limited, anecdotal or tenuous, so please send them to the coordinating contact, details below. If the site can be designated, then it is hoped a group of interested people could be formed to raise interest and awareness of the site. If there is proven to be an interest in the battle the Battlefield’s Trust would consider leading a walk at Mortimer’s Cross next year and separately perhaps provide a presentation about the battle for those who might struggle to walk. Investigations of the landscape and perhaps even some archeological surveys may follow if the right information comes forward. To register your interest or provide information please contact Patricia Pothecary 01568708597 or e-mail patricia@pothecary.net. There is a proposal from the Mortimer History Society to set up a new Mortimer Country History Trail and they need your help. Please see our news item for further information.